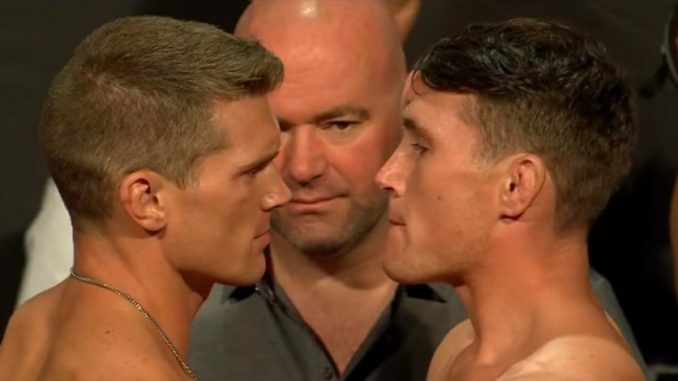 The main event of Sunday’s UFC main event in Liverpool, England between welterweights Stephen Thompson and Darren Till is still scheduled to go forward, despite Till missing weight by a significant margin on Saturday. At the early morning weigh-ins, Till stepped onto the scale at 174.5 pounds, missing the 171-pound limit and was given a one-hour allowance due to Till going through a family emergency. MMA Fighting’s Ariel Helwani reported that Thompson and his team have agreed to take the fight, but had a list of conditions. Till would be forced to surrender 30% of his purse, and Till could not weigh more than 188 pounds before leaving the hotel for the arena on Sunday at 1 pm local time. This is the second time Till has missed weight for a welterweight bout, weighing 176 pounds for a fight with Jessin Ayari in May 2017. Till spoke to MMA Junkie and admitted that staying under 188 pounds is not going to be easy and stated frankly, “it’s bad for me health.” He took full responsibility for missing weight and added that he offered to surrender 100% of his purse. UFC newcomer Molly McCann also missed weight, coming in at 127 pounds for her flyweight bout with Gillian Robertson. McCann will give up 20% of her fight purse for missing weight.